Cheryl Rice joined Deidre and JG this week to discuss the You Matter Marathon which requires no running! How can you can make a small difference in someone’s life with one small gesture and two small words? The You Matter Marathon is a global kindness and community building program that is all about creating connections and spreading kindness, compassion, and happiness. Participants are invited to give out small cards during the month of November that read the words, You Matter, to spread the message that the person receiving the card is important, loved, and appreciated. Giving out the cards helps to build the factors in our lives that lead to flourishing, expressing gratitude, engagement, and positivity. Cheryl held the first marathon in November 2016 and had participants in all 50 states and from 59 countries. Over half a million You Matter cards were given out last year and Cheryl expects to double that this year! 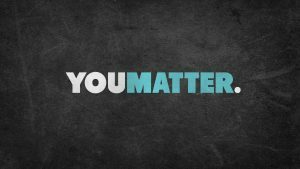 To get involved, go to www.youmattermarathon.com, watch the short video, and sign up to received your free You Matter cards! Tell other people they matter. It matters to them and it also matters to you. Make sure you’re finding time in your life to listen to your inner voice. Find people you can have nourishing relationships with. LISTENERS: HOW DO YOU SHOW THE PEOPLE IN YOUR LIFE THEY MATTER? Send us your answer. Either leave us a voicemail at 1-646-653-9278 or send us an email. We may talk about it - or we may even talk with YOU - on the air!